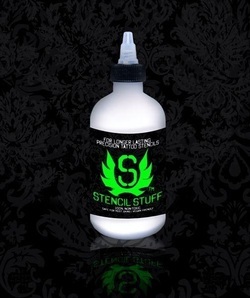 Stencil Stuff and Spray Stuff - JESSE JAYMES TATTOO CO. We have some of the best tattoo supplies for good prices. Stencil Stuff is a creamy lotion that has been laboratory formulated and tested to be non-toxic and safe for most skins. Stencil Stuff makes the transfer crisper, cleaner and sharper than using all other traditional methods and eliminates the possibility of cross-contamination. Stencil Stuff eliminates the need to bloodline or gray line. It also works exceptionally well if outlining is needed or desired. If there is a need to remove the transfer stencil for repositioning, it can be removed with alcohol. The original thermal copy stencil can be reapplied several times without the worry of using damaged stencils or having to make another. Stencil Stuff has become a necessity in the tattoo industry, used by thousands of professional tattoo artists everyday. Try Stencil Stuff one time and you'll wonder how you ever got by without it! One 4 oz. Bottle will last approximately 4 - 6 months and 8oz even more...only pennies per application. 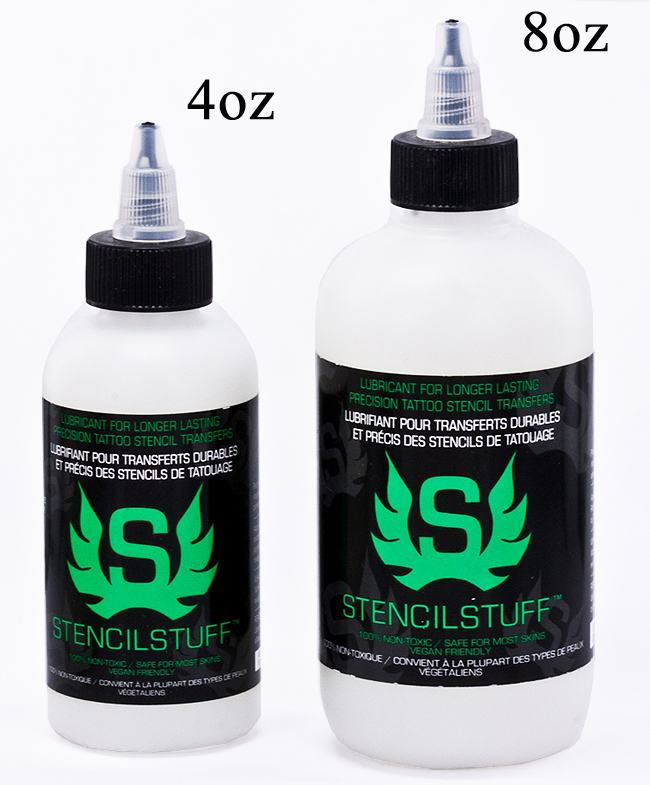 Stencil Stuff is known industry wide to be the best formula for transferring your tattoo stencils to your desired position on the client. to 5 seconds.Remove stencil and allow to set approximately 8 to 10 minutes...area is now ready. tattoo:Work from the bottom up, occasionally wiping away excess tattoo ink. Avoid excessive wiping. Removal: Use rubbing alcohol. For best results do not allow to dry completely.